Why? Well think about it, if you want to reach your goals, having a constant visual reminder of what you want to achieve becomes ingrained into your mind. Once in there, you are visualising all the more. Have you ever set that New Year resolution then struggle to remember what it was in March let alone ever achieve it. Well, this is an ideal time of year to set your 2017 goals using a vision board. Dreams remain dreams until you turn them into written goals. Take your list then find pictorial representation for each goal and build yourself a vision board. Use a cork board or A3 card, magazine & newspaper cuttings of pictures & words, family photos, glue and scissors and have some fun! How? This is the easy part; first, have a think about the eight life areas to set goals for. Family, work, financial, personal (self) education, spiritual, health and social. You don’t have to use all eight, but it helps with a variety. Make sure your goals stand up to scrutiny. Is your goal specific as opposed to just “I want to be a better leader“? This could be changed to “I will enrol on to a leadership course.” Good courses will benchmark you before and after the development, therefore you have a measurement. Ensure it is achievable and realistic; if you are a marathon runner perhaps stating a goal of running a marathon in less than one hour won’t be achieved. Put a time frame on each goal; “I want to lose a stone by end of April” is both realistic and achievable. I advocate an enjoyment factor should be built in. You want to spend more time with the family, which is one of my goals as my daughter and I have agreed to try a new sport for each month of 2017 which sounds like great fun! There will be one or two that we both do well in so this may become our sport of choice long into the future, which will be really enjoyable & rewarding. 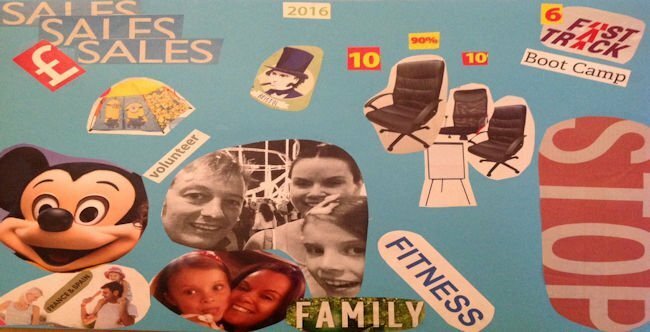 A vision board is very personal to you and once set for 2017 you can, of course, change bits throughout the year, but please don’t use this as cover up for any goal failure! I share mine with colleagues which creates a peer to peer accountability helping me achieve my goals. An ‘accountability buddy’ such as a fellow franchisee is great for development. My 2016 vision board is the picture above. 2017’s will be completed on 8th December. That is specific, isn’t it? Next PostNext What Are The Benefits Of Joining The AFA?